Radio waves from the auroras of planets like Jupiter could be used to detect exoplanets that orbit at large distances from their parent star, according to a new study. 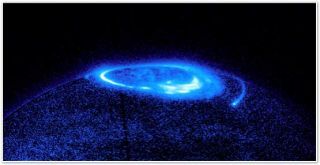 Auroras are flares of ultraviolet light in the upper atmosphere of planets. Scientists at the University of Leicester in England have shown that emissions from the radio aurora of planets such as Jupiter and Saturn could be detectable by radio telescopes such as the European Low Frequency Array, or LOFAR. Construction of the LOFAR radio telescope, with stations primarily located in the Netherlands, will be completed later this year. "This is the first study to predict the radio emissions by exoplanetary systems similar to those we find at Jupiter or Saturn," said Jonathan Nichols, who is presenting the study's results today (April 18) at the Royal Astronomical Society's National Astronomy Meeting in Wales. Nichols examined how the radio emissions of Jupiter-like exoplanets would be affected by the rotation rate of the planet, the rate of plasma outflow from a moon, the orbital distance of the planet and the ultraviolet brightness of the parent star. "In our solar system, we have a stable system with outer gas giants and inner terrestrial planets, like Earth, where life has been able to evolve," Nichols said. "Being able to detect Jupiter-like planets may help us find planetary systems like our own, with other planets that are capable of supporting life." Finding alien planets that orbit at large distances from their star remains a challenge, and of the hundreds of exoplanets that have been detected to date, less than 10 percent orbit at distances equivalent to the outer planets in our own solar system. Most exoplanets have been found using the so-called transit method, which detects the dimming of light as a planet moves — or transits — in front of a star. Another technique looks for a wobble effect as a star is tugged by the gravity of an orbiting planet. With both of these methods, it is easiest to detect planets that closely orbit the star and move very quickly. "Jupiter and Saturn take 12 and 30 years respectively to orbit the sun, so you would have to be incredibly lucky or look for a very long time to spot them by a transit or a wobble," Nichols said. The results have been accepted for publication in an upcoming issue of the Monthly Notices of the Royal Astronomical Society.